South AfricanWayde VanNiekerk smashed Michael Johnson’s long-standing 400m record when he stormed to Olympic gold on Sunday. Van Niekerk, running in the unfavoured lane eight, blasted off the final corner to time 43.03sec, 0.15sec quicker than Johnson’s previous world best set in Seville in 1999. Defending champion Kirani James of Grenada took silver in 43.76sec, with American Lashawn Merritt bronze (43.85). Despite Van Niekerk being world champion, his underwhelming heat runs had meant all eyes were on James and Merritt. The Grenadian set off fast in lane five, Merritt on his coat-tails on the inside with Van Niekerk running solo out wide. The trio had produced one of the races of the year in the 400m final at the 2015 world championships in Beijing, all going under 44 seconds as the South African won the fastest one-lap race of all time. And it was the same again in Rio, Van Niekerk exploding around the last bend and holding his form through the line in an exceptional run. “I have never seen anything like that,” Johnson told BBC, for whom he works as an analyst. “It is amazing. That was a massacre by Van Niekerk. This young man has done something truly special. He could go under 43 seconds — I tried and failed. “Being out in lane eight helped him, he was away from James and Merritt. He was running a time-trial. 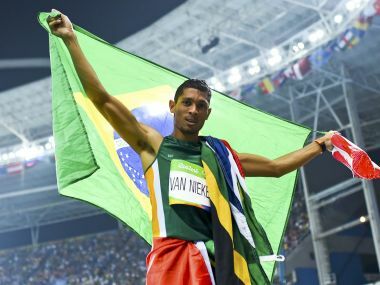 “That was some style he broke it in,” Johnson said of Van Niekerk, who made sprint history by becoming the first athlete to dip under benchmark times in the 100, 200 and 400m.